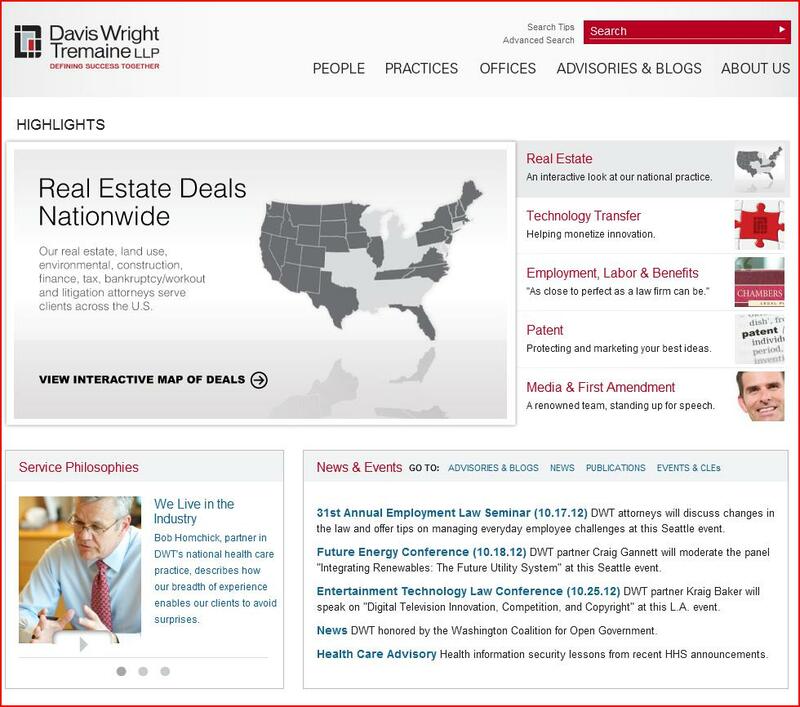 A full-service law firm specializing in Real Estate, Technology, Patent, Employment and Digital Media law. The firm has offices in eight US cities and Shanghai, China. The top navigation bar immediately highlights who, what, and where they are, as well as a link to advisories and blogs which establish DWT’s credibility and knowledge. A large “highlights” box in the upper right is used to promote their expertise in one of 5 adjacent categories listed on the left. The image rotates with every new visit. At the bottom of the Home Page is a large site map with links to Careers, About Us, Offices, Publications, and Presentations. The overall design gives an impression of efficiency and competence without arrogance. (There are no images of patent leather chairs, massive bookshelves or Harvard law degrees). The primary audiences would be potential new clients and existing clients. Secondary audiences would include jobseekers, interns, and employees. According to Alexis, based on internet averages, dwt.com is visited more frequently by females who are in the age range 45-54 and browse this site from work.